Organic Chemistry provides a comprehensive discussion of the basic principles of organic chemistry in their relation to a host of other fields in both physical and biological sciences. This book is written based on the premise that there are no shortcuts in organic chemistry, and that understanding and mastery cannot be achieved without devoting adequate time and attention to the theories and concepts of the discipline. It lays emphasis on connecting the basic principles of organic chemistry to real world challenges that require analysis, not just recall. 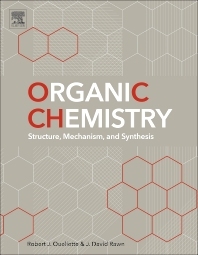 This text covers topics ranging from structure and bonding in organic compounds to functional groups and their properties; identification of functional groups by infrared spectroscopy; organic reaction mechanisms; structures and reactions of alkanes and cycloalkanes; nucleophilic substitution and elimination reactions; conjugated alkenes and allylic systems; electrophilic aromatic substitution; carboxylic acids; and synthetic polymers. Throughout the book, principles logically evolve from one to the next, from the simplest to the most complex examples, with abundant connections between the text and real world applications. There are extensive examples of biological relevance, along with a chapter on organometallic chemistry not found in other standard references. This book will be of interest to chemists, life scientists, food scientists, pharmacists, and students in the physical and life sciences. Robert J. Ouellette, Professor Emeritus, Department of Chemistry, The Ohio State University.